Nice accommodation overlooking the Coast Warm welcome, pleasant owners. Close to many tourist attractions. Lovely views. Perfect place for an escape Was lovely to stay for an early birthday getaway - we also attended the Lexus Long Apron Lunch which was amazing. Hosts are sensational people. Loved the time here This was so peaceful, we did as much or as little as we wanted, the hosts were fantastic. Cabin was superb. The candles, roses, port & chocolates were a great touch. I can't say enough about this place and the hosts. Loved it we will be back. Bad experience We did not stay we cancelled out because there was no apartment parking and the entrance door lock to gain access to the apartment was faulty. The owner should not be allowed to rent the apartment without guaranteed parking spaces. Never again. It's time to stop getting the green-eyed monster over your mates' overly-filtered travel pics. 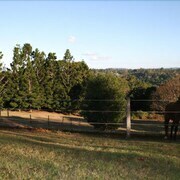 With loads of accommodations in Montville on offer, it's simple to get your own envy-inducing holiday on. Let's get real — pretty much everyone wants to stay in the thick of the action. 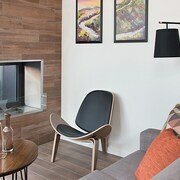 Luckily, you'll find 27 hotels within 5 kilometres of Montville's centre on lastminute.com.au. 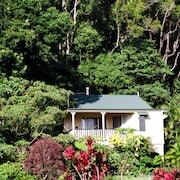 After a big day of sightseeing, laze about in bed at Narrows Escape Rainforest Retreat or the Clouds of Montville. They're both a few steps away from all the action. If they don't tickle you pink, the Hunchy Hideaway and the Montville Suites are just around the corner. 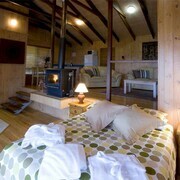 There are 3 available hotels in Buderim, such as the Amore On Buderim Luxury Rainforest Cabins and Buderim Motor Inn. This neighbourhood is 18 kilometres away from the centre of Montville, so keep that in mind! If you appreciate a good wine, ensure you visit Flame Hill Vineyard. Here, you can taste and buy a bottle of the renowned local drop. Location, location, location! Spend your stay at the Kondalilla Eco Resort and Montville Attic and you won't be far from it. On a clear, blue day, Kondalilla National Park is a fantastic space to take pleasure in what Mother Nature has to offer. Mayfield on Montville and Montville Mountain Inn are a couple of nearby places to crash out if you don't want to stay far away. You might also like to stay at the Oceans Mooloolaba, which is located 25 kilometres away. 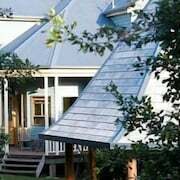 Or otherwise you might prefer the Spicers Tamarind Retreat, just a distance of 8 kilometres from Montville. 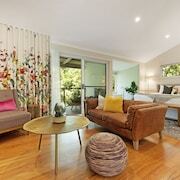 We'd also suggest the Eumarella Shores Noosa Lake Retreat and the Spicers Clovelly Estate. The first is 35 kilometres away from the center, while the second is 2 kilometres away. Looking for more things to do? Spend some time visiting the Big Kart Track and the Landsborough Museum. You'll find them in Bald Knob, 10 kilometres to the south of Montville. 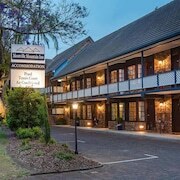 Some of our recommended Bald Knob hotel options are the Maleny Views Cottage Resort and House of Laurels. 11 kilometres to the northeast of Montville you'll also find Nambour, home to the Sunshine Coast Motor Lodge and Nambour Lodge Motel. While in Nambour, make sure you visit Sunshine Castle and Big Pineapple. Admit it. You're panicking, right? You've booked your flight but not your accommodation? Why not check out the Novotel Brisbane Airport? 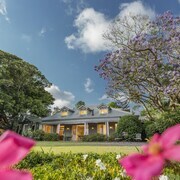 It's practically on the doorstep of Brisbane Airport, which is only 80 kilometres from Montville's centre.